The Selle Francais (or French Saddle Horse) is a warmblood type developed in the government stud farms in Le Pin in Normandy, France, in the 1800s. Where most warmbloods were crossed with draft types and Thoroughbreds, the Selle Francais was created by crossing the Anglo-Norman saddle type with the French Trotter. Other French breeds were later mixed in such as the Angevin, Limousin and Corlais. After World War II, the emphasis turned to breeding saddle horses rather than farm and cavalry horses and many regional breeds began to resemble one another. In 1958, the French government brought these breeds together under one name, le Cheval de Selle Francais. The breed excels in show jumping but is also successful in eventing and dressage. Some Selle Francais horses are run in what the French call “other than Thoroughbred” races. The Selle Francais studbooks are not closed, but the genealogy is usually Thoroughbred, French Trotter and Anglo-Arab. 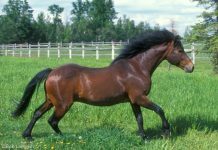 The Selle Francais is a muscular and athletic horse, with an elegant profile. 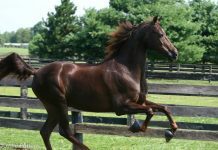 Horses are found in all colors, but chestnut and bay are the most common. The breed stands from 15.2 to 17 hands high.